Back in the 1970s when organized science-based skepticism was just getting on its feet, someone such as The Amazing Randi or Joe Nickell could just investigate and solve mysteries such as spoon bending, Bigfoot, crop circles, or the Roswell crash and share the information in Skeptical Inquirer magazine or with Johnny Carson. With a little care and attention, most wacky claims were debunked and the conclusions disseminated. Today, skeptics fight not only false assertions and misinterpretation of facts but also a fundamental distrust of science and a deep-seated paranoia about reputable institutions lying to the entire culture. As formidable as these issues are alone, they become exponentially worse because the spreaders of all this bad information have at their fingertips massive reach. Such is the case with flat earthers. On Sunday, June 10, 2018, about a dozen pro-science skeptics from the Independent Investigations Group (IIG) at the Center for Inquiry West in Los Angeles met a similar-sized group of flat earthers to demonstrate the curvature of the earth across the Salton Sea, a troubled body of salty water 160 miles southeast of Los Angeles, whose water level is going down and salinity is going up. There is also toxic dust from nearby agriculture that is polluting the air in the area. National Geographic Explorer was there to video the encounter. Though flat-earther models vary significantly, many believe water, like the rest of the planet, is flat. Assuming clear enough air and a powerful enough telescope, they believe a person standing near the water on one shore can see someone standing on another shore miles away. In fact, Earth’s curve makes an average-height person disappear below the horizon to a similar-sized person at a distance of about six miles. We decided to conduct this demonstration of a well-known fact for three reasons. First, as science-based skeptics we think it’s okay to question any proposition with sound inquiry, and we’re keen to hear which twisted denials the “high ranking” flat earthers who attended would proffer after they saw the curve for themselves. My eighteen years of experience with testing extraordinary claims has exposed me to a mountain of lame excuses. What would these be? Second, we were kind of excited to see the curvature ourselves. Most people know Earth is a sphere but don’t get to witness the evidence so beautifully through telescopes across bodies of water. Third, we wanted to address this rampant denier culture face to face. Skeptics use science to look into all sorts of wild claims but are willing to adjust their thinking when presented with strong evidence. Deniers refuse to accept conclusions even when there is overwhelming evidence and scientific consensus. Predictably, the demonstration went about as the science said it should. Our shore-to-shore, balloon-raised target couldn’t be seen from 9.6 miles until it was some forty-five feet in the air. The 9’x 6’ boat-based target lost most of one of its (one-foot-wide) horizontal stripes at three miles away from shore. 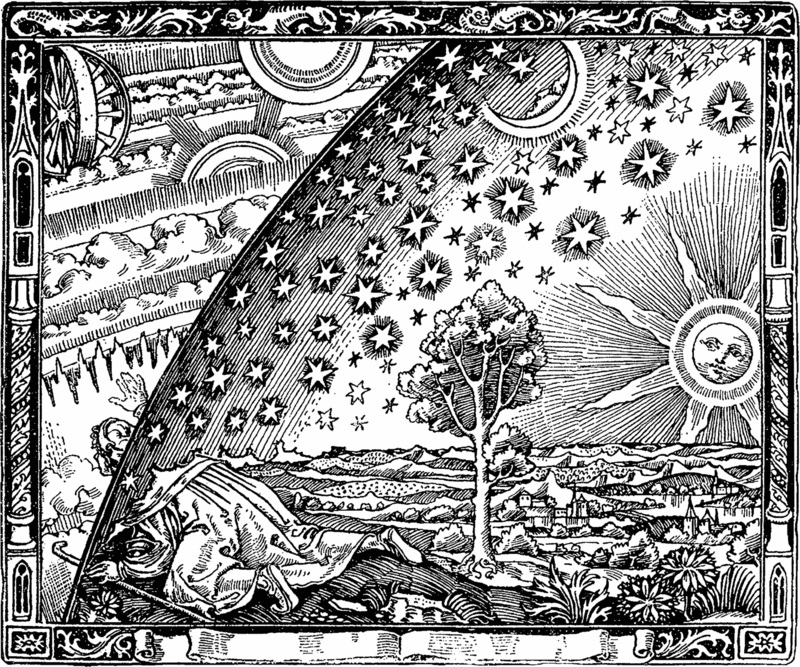 Wikipedia — The Flammarion engraving (1888) depicts a traveler who arrives at the edge of a flat Earth and sticks his head through the firmament. The flat-earth backpedaling to this confirmation was both immediate and fervent. The mental gymnastics ranged from “what we just saw didn’t happen like that” to citing non-Earth-curve-related optical effects that obscured the targets. They denied the validity of the whole demonstration, though only after it went against them. The post-demo face-off quickly devolved into tangents about the alleged “moon hoax,” NASA cover-ups, and why us “globers” can’t see how we’re being played by various powerful and secretive institutions. Therein lies one of the differences between today’s crackpots and the bizarre claims of the past. The flat earthers, the 9/11 “truthers,” the moon hoax advocates, chemtrail advocates, and any number of fringe groups believe in ideas that require massive conspiratorial cover-ups to hold together. They think powerful cabals are in charge of covering up bomb evidence at the World Trade Center, suppressing information about alien landings, and countless other schemes. The flat earthers bristled when I called them conspiracy theorists, then trumpeted the idea that higher-ups at NASA had PhotoShopped all the round Earth photos from space. This casual dismissal of scientific achievement is more than just wrong. It’s dangerous. Our species doesn’t make significant advances through popular opinion and webcasts. It makes them through hard work and the acquisition of expertise. There was a certain irony to many flat earthers using some form of GPS and highly engineered automobiles to get to the Salton Sea. They admit to owning computers and rely on modern, science-based medicine in emergencies but see no contradiction between their everyday implicit faith in science and what that same science says about the shape of Earth. Belief in a flat Earth may sound like a joke, but the proponents aren’t kidding. They are using science-based technology on a scientifically challenged populace to add to their credulous legions. Decades ago, the members of the lunatic fringe had trouble finding each other. Today, they grow.